^ a b Ally Sikora, "A long, drawn-out process," St. Petersburg Times, September 15, 2003. 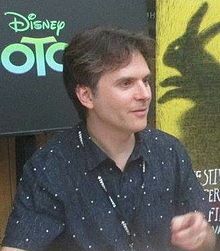 ^ Ramin Zahed, "Byron Howard to Direct New Disney Feature," Animation Magazine, May 6, 2013. ^ Borys Kit, "Disney, 'Tangled' Director Plot New Animated Feature With Jason Bateman," The Hollywood Reporter, May 3, 2013. ^ Ellen Wolff, "Animated Oscar noms took long road," Variety, February 5, 2009. ^ Peter Debruge, "Film Review: 'Zootopia'," Variety, February 12, 2016. ^ Dan Sarto, "Byron Howard and Rich Moore Talk 'Zootopia'," Animation World Network, December 4, 2015. ^ Christina Radish, "'Zootopia': Rich Moore, Byron Howard on Their Animated World, Frank Capra Influences," Collider.com, January 20, 2016.